In this post, l thought of doing a quick review on the Brunton Solaris 26 that I found on Amazon.com. The 26 is actually a full foldable solar panel array. The unit has a total power output of about 15.4 volts and 1.6 amps, assuming you take it out on a clear sunny day. That is not a lot of power, but if you are out in the wilderness, it is pretty much the only choice you have to get power. The best part about the Brunton 26 is its weight…or lack of it. The 26 weights only 1.7 pounds and it is also very flexible. The unit is made of some kind of rubberized nylon material. 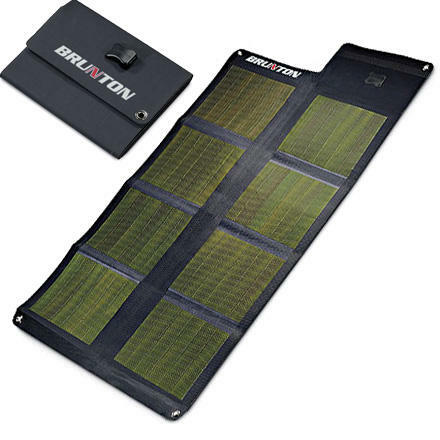 The Brunton 26 is very portable because it comes with a carry bag and also several different kind of power connectors so you can use it to charge a lead acid battery or your electronic gadgets. When the 26 is folded, it measure about 8 inches x 12 inches x 1 inch thick and it will fit nicely in your bag pack. The solar array is pretty much indestructible. You can drop it, throw it on the group, drop stuff on it and not having to worry too much about it getting damaged. When the 26 is unfolded, it measure 26 inches x 38 inches, which is fairly large. This is good because it gives you a greater space to collect the energy from the sun. To use the Brunton 26, you can simply unfold it, lay it out on a flat surface making sure there are no shadows cast over it. Next, connect the charging cable to the panel and then connect the device you want to charge to the cable. It is that simple. Want to know how you can reduce your home electricity bill with solar power. If you do, check out Michael Harvey’s Earth 4 Energy guide. It comes with pdf e-books and step by step High Definition (HD) instructional videos. Read the Earth4Energy reviews on this blog for more information.